I bought The Flight and The Disappeared, by M.R. Hall, from Bookmark in Spalding and took them with me on holiday to read. I had not heard of the author before, but Christine Hanson, the proprietor of Bookmark, had mounted a display of them in the shop and had also read The Flight, which she said was excellent. I was certainly prepared to accept her judgment. To confess the exact truth, I started The Flight, which is the later novel, first, and didn’t much like it. It deals with an air crash, and the first fifty pages or so reminded me very much of those disaster movies that were so popular in the 1980s, which had a very thin storyline and depended on the histrionics of the disaster itself to maintain interest. This was compounded by an amazing amount of technical detail that, although I dislike segregating books into ‘men’s reads’ and ‘women’s reads’, struck me as having more of a male than a female appeal. I therefore put The Flight aside and embarked upon The Disappeared. Upon picking it up, I thought immediately that it would be much more to my taste. The story is about the disappearance of two Muslim teenagers and how Jenny Cooper, the Severn Vale District Coroner, mounts an investigation into the cause of their deaths (as they have officially been declared dead, but no bodies found) seven years afterwards, at the request of the mother of one of them. The novel deals with several topical and sensitive issues, including Muslim extremism and the activities, sometimes of dubious legality, of the security services. All this is riveting, and beautifully written. What engaged me most of all, however, was the detailed and delicate portrayal of states of mind that can perhaps be described as hyper-sensitive, but by no means indicate madness or irrationality, and how those suffering from them can be persecuted by unscrupulous people trying to serve their own unethical purposes by discounting them or even bringing them into disrepute by suggesting that they are unreliable. Fine parallels are drawn between Jenny’s own mental state and that of Amira Jamal, the mother of one of the missing youths. Both need professional help for their mental conditions, yet each is perceptive and intelligent, with an intuitive understanding of the forces that are really at work, despite being disbelieved and ‘rubbished’ by others and, to differing extents, cowed by this. Yet, in both instances, the reader is left in some lingering doubt about their powers of judgment. A particularly good example of this occurs when Jenny’s sulky teenage son (with whom a more mentally robust mother would have had a straightforward conversation, setting out a few home truths) enlists the help of her smug ex-husband to move out of her house. While the son is packing, the husband explains that one of the reasons that the son is going is that Jenny is not fit to look after him, citing the fact that there is never any food in the house. From what has gone before, the reader knows that this statement, if exaggerated, has on several occasions been true (there are further occasions when the son has selfishly demolished all the food). It is left to the reader to reflect that a son in his last year at college should not be as helpless as this one appears to be, but it is a manifestation of the author’s considerable talent that Hall demonstrates that there are faults on both sides. It is from such balanced depiction of human relationships, and how they fray and chafe against each other, that the book gains distinction. The taut relationship between Jenny Cooper and her ex-policewoman clerk, Alison Trent, is also particularly well-drawn. So, having enjoyed The Disappeared immensely and devoured it impatiently to the last page, I decided to give The Flight another try. To any other reader who, like me, finds the first eighth or so of this book daunting, I’d like to say that it’s well worth persevering with. It’s true that there is a lot of technical detail throughout (and I can only applaud the author’s obvious mastery of it; I’m sure that a huge amount of research must have gone into the crafting of this novel), but the reason for it becomes increasingly apparent as the story progresses. M.R. Hall has constructed an intricate but worryingly believable plot which, even more than in The Disappeared, entrances as it unfolds. Jenny’s personal story is also developed well in this later work: she is released from some of her demons, but manages to create others in their place; and her dealings with Alison are even more fraught than in its predecessor. I’m delighted to have discovered M.R. 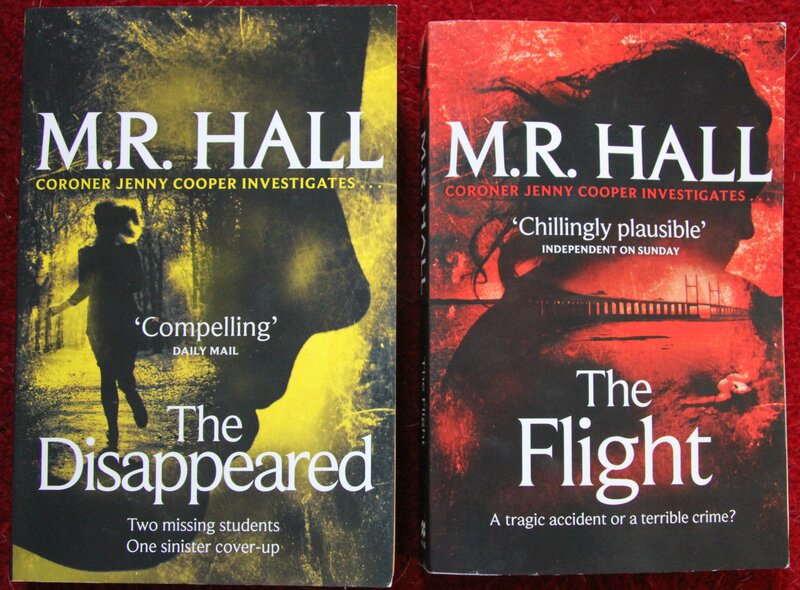 Hall, especially through one of my favourite bookshops, and look forward with impatience to the next Jenny Cooper story. In the meantime, I believe that there are a couple of others in the series that I have yet to read. Do I have any reservations at all? Only one comparatively minor one. It concerns the character of Jenny herself. Hall has been much praised for getting inside the head of a woman with such sympathy and understanding. I’d say that 95% of the time this praise is well-deserved, but sometimes Jenny is just a bit too snivelly and self-pitying for my taste, though she soon snaps out of it. Hall should perhaps consider that resourceful women who live alone never (in my experience) behave like this. They know that the knight in shining armour won’t come rushing to their aid and adopt a pragmatic approach accordingly – as Jenny always does, after her odd lapses. But, as I’ve said, this is a minor personal niggle, and possibly it’s unfair even to mention it. I wish I had been able to join the audience for the crime writer evening at Bookmark, Spalding, involving M.R. Hall, Chris Morgan Jones and William Ryan (whom I’m reading at the moment), to engage with them on their books. I really did need to read The Disappeared first, to get a feel for M.R. Hall as an author, but I certainly don’t regret reading The Flight, even if it was hard going for me at first. What a brilliant breakdown of two books Christina. You have definitely made me want to pick both books up! I can thoroughly recommend that you go back and start with the first novel, ‘The Coroner’ it sets the scene for the later books. I’ve read them all and loved them, good to see that others agree. He is a great writer and a great person too. I hope the Jenny Cooper series will get the attention and praise they deserve.